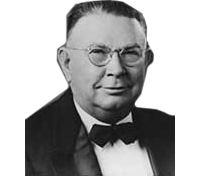 Ralph Rogers laid the groundwork for what is now the largest privately owned aggregate company in the United States. The company that started in 1908 with a single roadside operation in Bloomington, Ind., now operates quarries, asphalt plants and construction units in six states across the Midwest and Southeast. According to grandson Rick Rechter, a past Rogers Group chairman of the board, his grandfather started his life with little to his name. Rogers was not educated beyond the eighth grade, and it’s a mystery to the family how Rogers was able to finance the rapid growth of the company during World War II years. Regardless of how Rogers financed his company early on, he had the foresight to make investments at a time of great opportunity. The most famous Rogers Group project from that era was related to the Manhattan Project and the race to build a nuclear bomb. The U.S. settled on a valley in Tennessee to do this research and development. The city of Oak Ridge, Tenn., emerged from that valley, and it immediately became one of the largest cities in the state because the production staff there needed housing. Of course, behind Oak Ridge’s rise and the Clinton Engineer Works facility was Rogers. In addition to Oak Ridge, Rogers Group was the primary aggregate provider for several other military installations. Among them were Camp Forrest in Tennessee; Fort Campbell in Kentucky; the U.S. Naval Ammunitions Depot in Indiana; and Redstone Arsenal in Alabama. “If you look at the history of war and all of the major Army bases in the Midwest, Ralph had an aggregate operation there,” Rick says. In later years, Rogers and his partners were among the first major road builders involved in President Dwight Eisenhower’s Interstate Highway System. Rogers Group supplied stone for major interstate sections in Alabama, Indiana, Kentucky, Ohio and Tennessee, and it built some of those sections as well. “He had the spirit of a true entrepreneur because he expanded the company into various geographic markets based on his concept of where opportunities would be,” says Jerry Geraghty, president and CEO at Rogers Group. Rogers was a bit unique in that he largely chose not to operate in big cities. Despite having roots in Indiana, Rogers never had an operation in Indianapolis. He avoided Illinois, as well, because the politicians there concerned him. “He chose states and communities within those states where politicians did not have their hands in [businesses],” Rick says. According to Rick, Ralph was effective at managing operations in multiple states because he was highly mobile. Perhaps Rogers’ greatest asset was his people. He was a good judge of men, Rick says, and he surrounded himself in post-war years with middle managers who were war veterans. “His ability to pick that group after the war propelled us and left me with a really good bunch of engineers, construction people and miners,” Rick says. Rogers also created a corporate culture in which the “man in the pit” was just as important as the company’s executives and elected officials. According to Ben, Ralph paid his workers well and offered health and welfare insurance to employees ahead of the industry. Ralph also put his workers’ safety first, and that probably endeared many workers to him. Rogers actually began working around 1905 on a construction crew in southern Indiana. He learned the road-building industry through his work as a driver for a crew supervisor, and in 1908 he and his business partners launched Bloomington Crushed Stone in Indiana. The stage was set for Rogers Group, and within 20 years Rogers had expanded the business to three other states. Key to the company’s rise was Ralph’s belief in maintaining partnerships and sharing risk with others, Geraghty adds.